From the national spokesperson for Everytown for Gun Safety and leading gun violence prevention advocate comes the riveting memoir of a mother’s loss and call to action, as well as a faith-based exploration of how the nation’s gun laws put a deadly target on American lives. Lucia Kay McBath knew deep down that a bullet could one day take her son. After all, she had watched the news of countless unarmed black men unjustly gunned down. 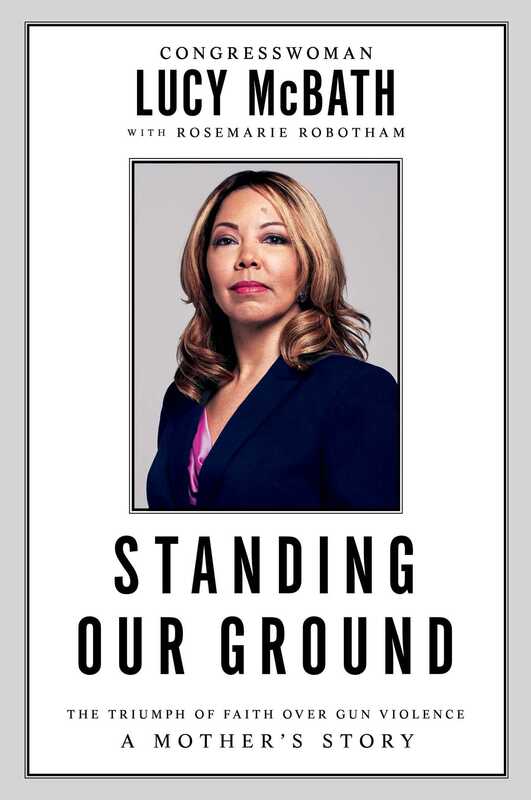 Standing Our Ground: Putting Faith in God Over Faith in Guns is McBath’s memoir of raising, loving, and losing her son to gun violence, and the story of how she transformed her pain into activism. After seventeen-year-old Jordan Davis was shot by a man who thought the music playing on his car stereo was too loud, the nation grieved yet again for the unnecessary loss of life. Here, McBath goes beyond the timeline and the assailant’s defense—Stand Your Ground—to present an emotional account of her fervent fight for justice, and her awakening to a cause that will drive the rest of her days. But more than McBath’s story or that of her son, Standing Our Ground keenly observes the social and political evolution of America’s gun culture. A must-read for anyone concerned with gun safety in America, it harkens back to such bestsellers as The Short and Tragic Life of Robert Peace and Nobody. IN THAT DARKENED AUDITORIUM, I was one of a few brown faces among the mostly white evangelicals filling the seats around me. Not for the first time, I wondered why so few of the faith congregations I spoke to reflected the multihued family of God. I was in Columbia, South Carolina, for a screening of the award-winning documentary The Armor of Light. This deeply provocative film wrestles with theological questions of guns and faith, and features a pro-life white evangelical minister, and me, an African American mother grieving the loss of my only son to gun violence. The Reverend Rob Schenck and I had been asked to participate in a panel discussion following the screening, along with Abigail Disney, the filmmaker who brought us together. As the opening credits rolled and a haunting score filled the theater, I silently asked God to speak through me that night, and to open my listeners’ hearts to his message. Twenty-five minutes later, my body clenched against a fresh onslaught of pain as I watched myself on-screen: I was talking about my son, Jordan Russell Davis, who at seventeen had been fatally shot at a Jacksonville, Florida, gas station by a white man who thought the rap music he and his friends were playing on their car stereo was too loud. As Jordan lay dying, the shooter drove away from the scene. We would soon discover that he was a licensed gun owner in the state of Florida, and a member of the National Rifle Association (NRA), which likely meant he took it as an article of Second Amendment faith that the blood he’d just spilled would soon be washed clean by a law called Stand Your Ground. He knew that under the statute, all he had to prove was that he believed the four black boys in the red Dodge Durango would do him harm. That claim alone gave him the right to use lethal force rather than to seek de-escalation and retreat. The NRA’s response to this increase was to offer up to $150,000 for criminal defense reimbursement, and up to one million dollars in liability protection should its members face legal reprisals after invoking the “shoot-first” law. And so, when arrested the next day, my son’s killer immediately told police he’d felt threatened by Jordan and his friends. Despite the boys being unarmed, the shooter insisted he’d fired on them in self-defense. I will never forget the way my breath left my body at the moment I grasped that the value of a black boy’s life had been part of the shooter’s split-second calculation before he reached for his gun. Suddenly, it was crystal clear to me what my son had been up against—a man who believed he could shoot to kill based on nothing more than a feeling, because he reckoned the state’s gun law would absolve him in the death of an African American boy. No doubt he was rolling the dice that, if charged, his fate would lie in the hands of jurors who harbored the same deep-rooted biases and fears as he did—prejudices as old as America itself. It was my opposition to the Stand Your Ground law that had led to my initial meeting, the one that would be filmed, with Rev. Rob Schenck. As chairman of the Evangelical Church Alliance, Rob had been unable to reconcile the pro-life stance of the Christian Right with its intense pro-gun fervor. He would eventually break with the evangelical leadership over its position on guns, but at the time we were making the film that hadn’t happened yet. His theological struggle was the subject of our taped discussion as we’d sat in his rock-walled garden in the nation’s capital and shared our respective encounters with gun violence. My comment stunned the minister into silence, because he knew as well as I did that the largest and most zealous gun-owning demographic in America was his own flock—white evangelical Christians—along with less religious whites who held strong right-wing political views. They were, in a sense, “political evangelicals,” unshakably committed to the party of Reagan. Now, sitting with the reverend in a darkened theater in Columbia, South Carolina, I contemplated how one squared the commandment “Thou shalt not kill” with the readiness to take a human life. I weighed the ironies. Earlier, I had seen a man in a T-shirt emblazoned with the words “IN GUNS WE TRUST.” I felt exactly the opposite. Surrendering my personal safety not to guns, but to God, felt like the ultimate security. Perhaps my own lack of fear had something to do with the fact that the very worst day of my life had already come and gone, and somehow, I was still standing. Even so, I believed my Heavenly Father would protect me always, no matter the threats of death or sexual violence that I so often received as an advocate for commonsense gun laws—and despite the bullets that had pierced the flesh of my beloved child. To be clear: I completely understand owning a gun for sport or recreational purposes as well as for self-defense. I am not, and have never been, opposed to the Second Amendment. My own father was a hunter. I grew up in a household where there was always a licensed firearm, one that was stored and used with utmost respect and care. Even so, I question why so many white evangelicals, as well as non-churchgoing Christian whites, are now stockpiling military-grade assault weapons and high-capacity magazines expressly designed to wipe out scores of people quickly. Do they feel that unsafe? More to the point, doesn’t our faith require that we put our trust in God to guard and defend us, rather than in our guns? I have since come to understand that the attitudes that helped create a gun culture so dangerous to boys like mine, were bred in the hearts of citizens who profess their faith in God as fervently as they profess their right to bear arms. With the rise of the Christian Right as a political wave in the 1980s—one dedicated to preserving, among other values, the supremacy of whiteness—large swaths of America’s evangelical population were coached by the profit-making agenda of the NRA to embrace fear and suspicion of anyone they saw as different from themselves, forsaking trust in God’s protection and faith in the humanity of their fellow citizens. These were some of the people I hoped to connect with in Columbia, South Carolina, that evening. I wanted to reach across America’s cultural divide to open people’s eyes to the epidemic of gun violence that has the nation in its cross hairs. I wanted that audience to understand that it isn’t only boys like Jordan who are at risk; their sons and daughters are endangered, too, because whenever there is a gun in the midst of a conflict, no matter how minor or survivable the circumstance, too often someone ends up dead. In America, while individuals might discriminate based on deep-seated historical prejudices, firearms are ruthlessly egalitarian. People of every complexion fall victim to gun violence—a total of thirty-three thousand fatalities every year and ninety-six gun deaths every single day. Among the dead are those spectacularly cut down in mass shootings at schools and churches, malls and movie theaters, workplaces and public parks. Less visible, but exponentially more numerous, are the women and other relatives murdered by domestic abusers who kept a gun in the bedside table drawer; heartsick teenagers who sucked on the barrel of a pistol; gang members acting out cruel grudges and initiations; children who accidentally discharged a weapon they believed was a toy. With so many guns in the possession of ordinary citizens, no one is immune. The scourge of violence cuts across all races, all ages and economic classes, all familial circumstances, affecting every corner of our society. Death by firearm can just as easily occur in poor, crime-ridden neighborhoods as in middle- and upper-income communities. We are, every one of us, trapped in this ongoing nightmare together. We have no choice but to stand together, and to stand our ground. As the national spokesperson and faith and outreach leader for Everytown for Gun Safety and Moms Demand Action for Gun Sense in America, I’ve learned that one of the most effective tools in our arsenal is sharing our stories. The potency of personal experience is one reason that student survivors of the February 2018 school massacre in Parkland, Florida, were able to galvanize the nation with their calls for gun law reform. In much the same way that protesters had spilled onto the streets of Ferguson, Missouri, four years before, demanding an end to police violence against African American bodies, the survivors of the Parkland school shooting challenged us all, insisting we confront the failures of culture and government that allowed a troubled nineteen-year-old to mow down seventeen of their friends with a weapon of war. I could cite numbers to show the enormity of the crisis we face, but in the end, it is our stories that will arouse people to step into the fray. By telling our stories, we shed light on the issues that define our lives; we become familiar and known to one another; and we create a space for other people to become engaged. Survivor stories like mine have helped convince 90 percent of Americans to support laws preventing the mentally ill from purchasing firearms, and fully three-quarters of the five million members of the NRA support universal background checks on all firearm sales. But their voices mean little to the organization’s leadership. Guns in America are a deep, dark business, one that disguises its base capitalist motive by misdirecting our attention to issues of race, politics, and faith. Beyond the smoke and mirrors, this book shows how the gun lobby won the allegiance of evangelicals in the 1980s, and traces how the Second Amendment came to symbolize freedom from government intrusion, even as NRA money put lawmakers in office who would loosen regulations beyond reason. The narrative also examines how the gun lobby enshrined whites’ Second Amendment fervor by inciting fear of black and brown bodies; explores theological arguments surrounding the right to bear arms; and suggests how faith ministries can help redress the violence tearing our communities apart. But this is not a dry social analysis of America’s gun culture. Rather, this book is the blood and guts of my life, the hard nights, and the unexpected brilliance of morning. It is the account of my son’s short life and violent death, our family’s search for justice, and my awakening to a call that will drive the rest of my days. At its heart, this book is a mother’s story—my way of making sure that my son’s seventeen years on this earth will continue to have meaning. Perhaps the most extraordinary part of my journey has been watching my life be transformed in the wake of Jordan’s death, being called out of the boat, stepping out on the water for a cause. Just as God did with Abraham, he said to me, I am going to take you to a land where you’ve never been. You won’t know anybody at first, you won’t know how to do what I am asking of you, but I just need you to go. I will guide your steps. I know in every cell of my body that my son came into this world to make a difference, and in the end, he helped deliver me to my highest calling. His death showed me that I am to be a voice in the wilderness, joining a dynamic group of activists who are working to stem a red tide of violence, one fueled by the deadly interplay of guns, race, politics, and faith in American life. I have no doubt this is my divinely appointed purpose, but when tragedy arrived at my door in a sudden senseless burst of gunfire, I thought I had failed my child. I believed my life was over. And perhaps it was. But a new life opened up before me, and there was nothing else for me to do but claim it. In telling my story—and honoring the life of the child God entrusted to me—I am claiming it still. "Lucy McBath turned her own personal tragedy into action by becoming a staunch advocate for civil and human rights. Lucy is a truth-teller, justice warrior, a fighter, and a crusader in her quest to lift the humanity of the most vulnerable amongst us. I look to her for inspiration daily."